.The bantam version is1/4 size but looks the same in appearance. 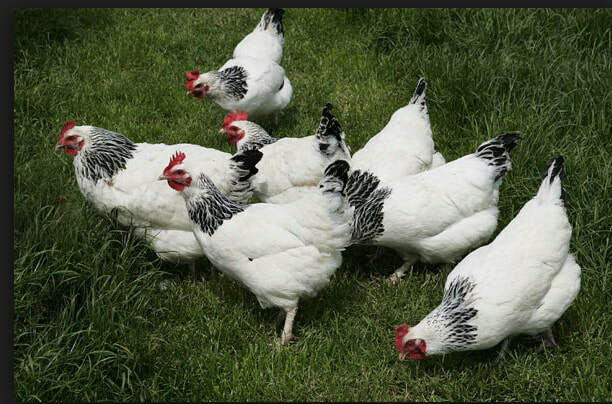 Motherhen's Notes: Popular bird for egg laying. The Light Sussex was first recognized in the Victorian Era. They are docile and sweet natured. Generally healthy. Light varieties are the best layers. Can lay more than 200 eggs a year. Their eggs are white or light colored. They brood easily and will hatch eggs from other birds including duck and geese eggs. Roosters is sweet natured toward people but protective over the flock. If you are looking for a good sturdy laying hen to start your flock this is the bird for you!